Strathclyde University students accumulated 18,646 volunteering hours last year. Boasting eight floors filled with bars, music and places to eat, the University of Strathclyde Students' Association is the largest in the country. But the building is not only a hive of activity for those wishing to let their hair down after class or those popping in to grab a quick bite. It is also home to over 100 clubs and societies made up of students. From political and activism, faith and culture to media, arts and music, hobbies and interests, the many clubs and societies offer students the chance to get to know others and take part in something that they are passionate about. There are also clubs such as CACTUS (Community Action at the University of Strathclyde) and RAG (Raising And Giving Strathclyde's charities appeal) which involves students volunteering in the community and raising money for charity. Students who take up key positions in these groups and who actively go out and help in the community are contributing to the students' association’s already established Investing in Volunteer status. The University of Strathclyde Students' Association was the first student union in Scotland to achieve Investing in Volunteers status. It has also just become the first to successfully gain re-recognition this year - something the volunteering students and the association staff are taking great pride in. And with the final recorded number of volunteer hours for 2011-12 standing at 18,646, working out at over £100,000 worth of hours calculated at the national minimum wage rate, it is easy to see why. 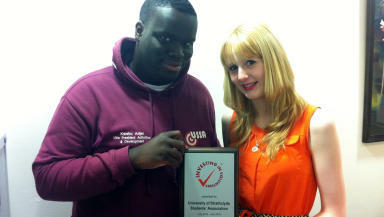 For 23-year-old Kwaku Adjei taking up volunteering activities at university changed his life. He had studied a previous degree where he focussed mainly on his course work. 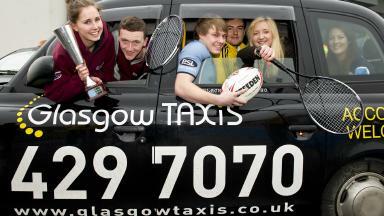 But when it was time to start at Strathclyde University he knew that he would like to get more involved. Starting as a volunteer in the Welcome Team for new students, Kwaku went on to become a class representative and is now vice president of activities and development. He said: "I started in the Welcome Team and I thought that it was absolutely awesome so I stuck around for a bit. "I then became a class rep and used that to form a society for my department. I organised an end of year ball amongst other things and raised money for charity. "I didn’t even know I was going to properly run for vice president until January. It wasn’t a goal I had I just done volunteering and I loved it. "I like doing things for my department so I thought I would do it for the whole university and luckily I got it." The volunteering definition used at the students' association is doing something to benefit students or the Strathclyde name without getting paid for it. This can include running a club or society or volunteering in the wider community. For Kwaku the experience of volunteering has contributed greatly to his overall student experience. He said: "I like to gab, I like meeting new people, it’s just amazing because whenever I come into the union just for lunch or whatever there are all sorts of people who say hi to me. "The union is like a second home to me and coming in here and just getting constant smiles and handshakes is awesome." He added: "Coming from somebody who has studied a second degree, at the last university I just did what was given to me. "That was a much harder course that I did but coming here and doing all of the volunteering I have learned a lot more. I would say that I’ve learned a lot more even if I was studying a PhD or something. "It has just taught me so much life experience. You can learn things academically fair enough but you need to be life savvy, this is just an amazing opportunity." And for 20-year-old Shaunagh Cooke volunteering has had similar rewards. She is in the third year of her physics degree and is vice chair of activities at the students' association. But she says that taking part in volunteering activities does not get in the way of her studies and instead helps her. Shaunagh first got involved three years ago with the Welcome Team at Freshers’ Week. Now she is part of the charity group RAG and help’s with the Bright Futures Society which works in collaboration with the Careers Service. "I found volunteering has really helped my student experience because I don’t really talk to many people on my course and this gives me a whole new lease of life outside that which is amazing," she said. Volunteering students are each recognised for 50, 100 and 200 hours of service. And it is the aim this year to promote volunteering at the university even more. Carole McGreigh, volunteer development advisor, said: "It’s so different from any other volunteering because the students are getting skills, they’re getting their office and admin skills, they are recruiting people, they are working with budgets, they’re having to apply for grants, they’re running campaigns, they’re setting up events, they’re working with external and internal venues. "The experience is vast it depends on the individual and what they want to get out of it."